The posterior tibial tendon (PTT) lies within the calf of the leg. The tendon passes behind the medial malleolus of the ankle and attaches to a bone in the foot called the navicular. The navicular bone is a key structural component in forming the arch of the foot. The PTT is essential to the normal functioning of the foot by keeping the navicular bone in the proper position. PTT injuries generally fall into two categories: traumatic and degenerative. A traumatic tear may occur spontaneously or after a twisting injury. A degenerative tear develops over time, usually related to a slowly developing tearing (or stretching) of the tendon. Some factors that contribute to degenerative PTT problems: diabetes, hypertension, obesity, previous trauma or surgery to the inside of the ankle, steroid injections, and prolonged periods of standing and walking. The most common cause, however, appears to be an aging process of a flat foot. Initially, the tendon has an area of inflammation that begins to degenerate. As it does, the tendon may begin to have microscopic tearing. This results in a structural weakening of the tendon which starts to stretch out, causing further tearing. During this process, the area around the tendon gets painful and swollen. 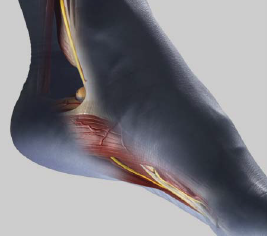 When the tendon stretches and weakens, it can’t support the arch of the foot. Even if the tendon remains in one piece, it stretches out and weakens too much to stabilize the arch. This causes the arch to collapse, which further stretches the tendon, causing more damage and tearing. The injury is described as posterior tibial tendinosis, a dysfunctional posterior tibial tendon or a partial tear of the PTT. Without proper treatment – or sometimes, even with it – the damage is so advanced that healing fails to occur and the tendon ruptures. In severe cases, or if the problem fails to improve with non-operative treatment, surgery may be required. The surgery focuses on two problems: (i) the degenerated PT tendon and (ii) the foot deformity. A badly degenerated or a ruptured tendon cannot be repaired, and will require a tendon transfer, which involves replacing the damaged tendon with a healthy tendon. Usually, another tendon in the foot such as the tendon that flexes the four smaller toes (flexor digitorum longus tendon) is used as the tendon transfer to replace the PTT. Once the tendon problem is addressed, your surgeon will also address your foot deformity. If the foot deformity is flexible, the surgeon can often correct it by repositioning the heel bone (calcaneal osteotomy) and/or performing osteotomies and fusions of the midfoot. These procedures are called ‘extra-articular flat foot reconstructions’ – they help to reposition your foot without stiffening up the joints. In the most advanced cases of posterior tibial tendinitis, when the arch of the foot has become rigid, a subtalar of triple fusion of the foot is the preferred treatment. These procedures are aimed at restoring the architecture of your foot by correcting the alignment of your hindfoot bones and fusing (welding) them together. It is important to understand that you primarily lose the side-to-side motion of your foot. The up-and-down motion at the ankle joint is preserved. You will have bandages or dressing to protect the incision(s). It will take about 8 to 12 weeks before the soft tissues and bones are well healed after surgery. You will be placed in a walking boot or cast during this period to protect the tendon and the bony repairs. You will probably need crutches as well. Up to 4 months of physiotherapy may also be needed after these procedures. The physiotherapist’s goal is to help you keep your pain and swelling under control, improve your range of motion and strength, and ensure that you regain a normal walking pattern. As your symptoms ease and your strength improves, you’ll be guided through advancing stages of exercise.